Part Two of The Series: Creative Expressions of African American Cultures, Speedo Green: Sing For Your Life comes to DeVos Performance Hall on Tuesday, March 26th, 2019 at 7:00PM. 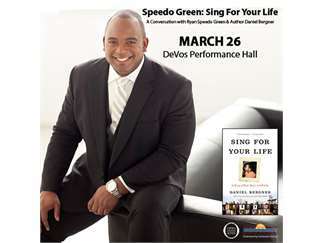 Join in the conversation between Met Opera singer Ryan "Speedo" Green and author of biography, Sing For Your Life, Daniel Bergner. Discussing a story of race, music and family. A touching and triumphant story of a young black man's journey from violence and despair to one of the world's most elite artistic institutions. Live on DeVos Performance Hall stage Tuesday, March 26th. Speedo will showcase his natural talent performing a few arias (long song accompanying a solo voice), followed by a Q&A session with Speedo Green and Daniel Bergner. Tickets go on sale Thursday, January 10th at 10:00AM.